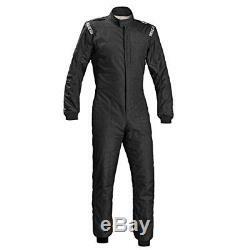 Brand New with Tags - SPARCO PRIME SP-16 Race Suit. The Prime SP-16 race suit from Sparco is manufactured using a triple-layer combination of exceptional lightweight materials to make it one of the lightest racing suits in the world. Ergonomic Nomex fabric, providing excellent anti-static properties, is used to create the protective double-faced outer layer of the suit. Featuring a slimmer zip, lighter wrists, ankles, neck and shoulders, the Prime SP-16 racing suit has a vast weight reduction over its predecessor. Ultra-thin stitching is incorporated on all decorative items and structural components feature a flat stitching pattern. Fully floating sleeves and stretch panels are included on the race suit to ensure maximum comfort for the wearer, especially during extended periods of use. Shoulder epaulettes are also included on the suit to allow for easy integration with an FHR device. The item "NEW SPARCO PRIME SP-16 SP16 Rally Race Overall Racing Suit FIA Approved Size 60" is in sale since Friday, October 5, 2018. This item is in the category "Vehicle Parts & Accessories\Clothing, Helmets & Protection\Car & Kart Racewear\Race Suits". The seller is "rod033" and is located in Reading. This item can be shipped to United Kingdom, Austria, Belgium, Bulgaria, Croatia, Cyprus, Czech republic, Denmark, Estonia, Finland, France, Germany, Greece, Hungary, Ireland, Italy, Latvia, Lithuania, Luxembourg, Malta, Netherlands, Poland, Portugal, Romania, Slovakia, Slovenia, Spain, Sweden, Australia, United States, Canada, Brazil, Japan, New Zealand, China, Israel, Hong Kong, Norway, Indonesia, Malaysia, Mexico, Singapore, South Korea, Switzerland, Taiwan, Thailand, Bangladesh, Bermuda, Bolivia, Barbados, Brunei darussalam, Cayman islands, Ecuador, Egypt, Guernsey, Gibraltar, Guadeloupe, French guiana, Iceland, Jersey, Jordan, Cambodia, Liechtenstein, Sri lanka, Macao, Monaco, Maldives, Martinique, Nicaragua, Oman, Pakistan, Peru, Paraguay, Reunion, Saudi arabia, South africa, United arab emirates, Ukraine, Chile.